Researchers from the United States developed new life-saving devices that could self-charge using the mechanical motion of the heart. Heart arrhythmia, also known as an irregular heartbeat, causes a person’s heart to beat too quickly, too slowly, or with an irregular pattern. Millions of Canadians currently experience irregular heart rhythms. Arrhythmias can cause sudden cardiac death, killing almost 40,000 adults a year. Many factors can affect heart rhythms, such as high blood pressure, high blood cholesterol, congenital heart defects, smoking, and stress. Signs and symptoms of arrhythmias include fast or slow heartbeat, skipping beats, chest discomfort, shortness of breath, and weakness. Pacemakers are small implantable devices that help the heart beat more regularly. They work with a small electrical stimulation that helps control the heartbeat. According to the Canadian Journal of Cardiology, nearly 200,000 Canadians are living with pacemakers or implantable defibrillators. These life-saving devices are often implanted under the skin. They are powered by batteries that need to be replaced every five to eight years. Those entire replacements, however, require an additional surgery that can be costly, and increase the risks of complications, infections, or deaths. In a study funded by the National Institutes of Health, a group of engineers and clinicians from the UT Health San Antonio, the United States, developed a method that can self-charge the implantable devices using the mechanical motion of the heart. 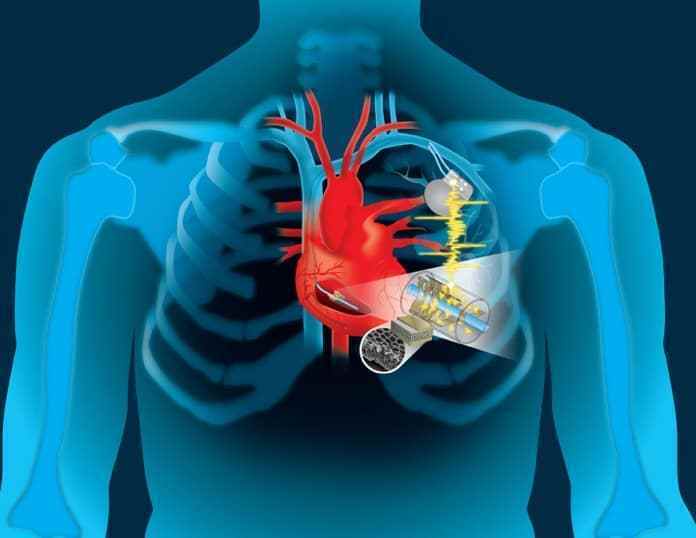 Using a special polymer thin film, the researchers designed a dual-cantilever which wrapped around the pacemaker lead with two free ends sticking out for harvesting energy from the heart motion. The researchers recently published their results in Advanced Materials Technologies. Under different working configurations, the researchers successfully harvested electrical powers of 0.5 V and 43 nA only under a slow mechanical motion of 1 Hz. More surprisingly, the devices could potentially be used as sensors to facilitate data collection for real-time monitoring of patients. This innovation can help extend the lifetime and effectiveness of implantable biomedical devices such as pacemakers and defibrillators. The researchers have recently obtained regulatory approval for commercialization and it is expected that soon this life-saving device will be available to the market. Reference: Dong, L. et al. Flexible Porous Piezoelectric Cantilever on a Pacemaker Lead for Compact Energy Harvesting. Advanced Materials Technologies, 2019;4:1800148. DOI: 10.1002/admt.20180014.